Favourite Books of 2012: Prehistory, Myth and Fiction. I have been engaged in debates during the course of this year, as to whether “historical fiction” can exist where there is no history. Writers such as Hilary Mantel and Cathie Dunn clearly draw extensively on the historical record to inform their fiction, but if one is writing, as I do in Undreamed Shores, about a period before written history, does it still count as “historical fiction”? It’s a semantic question, of course, but semantics matter to a writer. Given my long-standing interest in this theme, it probably comes as no surprise that my final selection falls on two books that seek to push the boundaries of “historical fiction” back in time. 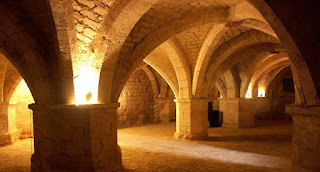 Nancy Jardine’s The Beltane Choice (Crooked Cat 2012) is set in northern Britain in the 1st Century AD, J.P. Reedman’s Stone Lord (Mirador 2012) in southern and western Britain in the 2nd Millennium BC. Strictly speaking, Jardine does have some history to inform her work, notably Tacitus’s Agricola. Given, however, that Tacitus almost certainly never visited Britain; that he relied for information mainly on his father-in-law, whose biography he was engaged in writing; and that Jardine, in any case, like Dunn, is concerned with the lives of ordinary people caught up in the sweep of history (the sort of people unlikely to have come to the attention of the historian or his military father-in-law), the historical record provides only minimal assistance. Archaeology and mythology provide far richer seams for these writers to mine. Both draw extensively on archaeological evidence, and both also make extensive use of myth, recognising the possibility that myths written down in one age may embody (in Reedman’s words), “older substrata,” a sort of literary equivalent to the physical marks in the landscape of which MacFarlane writes so eloquently. Pursued by a wild boar - her prey, which has become her pursuer, Nara takes refuge in a tree, calling out to two deities, the goddess Rhianna and the horned god, Cernunnos. Gods and spirits haunt the pages of these novels, but this is not fantasy in the vein of Tolkien or C.S. Lewis: the reader is not called upon to believe in their reality on an objective plane, only to understand their reality in the minds of the characters. 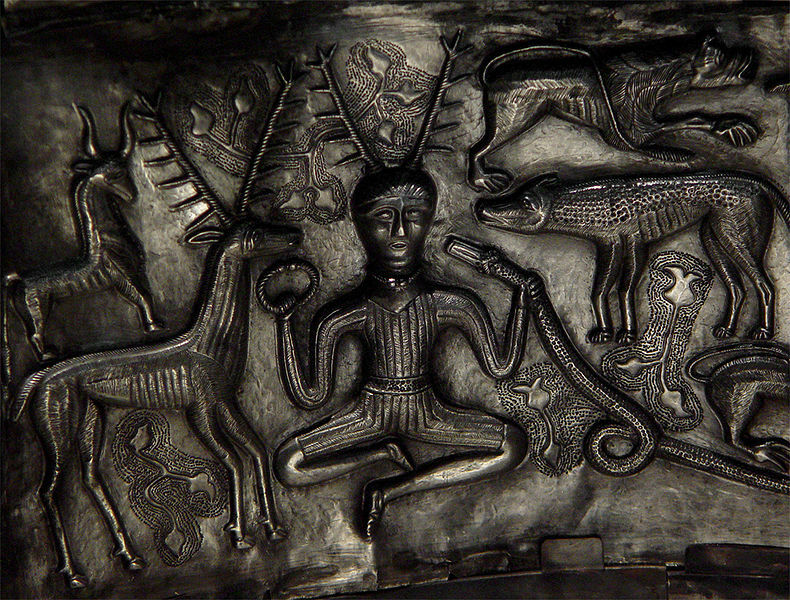 Depiction, believed to be of Cernunnos, on an Iron Age cauldron found at Gundestrup, Denmark. 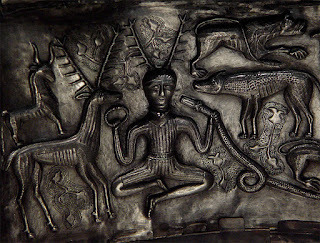 “The horned chief,” dubbed Min’Kammus by Reedman, is Cernunnos in another guise, but in her reference to “The Old Hunters,” Reedman traces a conceptual thread back to the Mesolithic world of the hunters in whose footsteps Robert MacFarlane walked out from the familiarity of Essex into the now-drowned world of “Doggerland.” There is, perhaps, some archaeological basis for this, albeit tenuous. At Star Carr in Yorkshire, fragments of deer-skull have been found, dating back ten thousand years, modified so as to allow them to be worn as head-dresses. 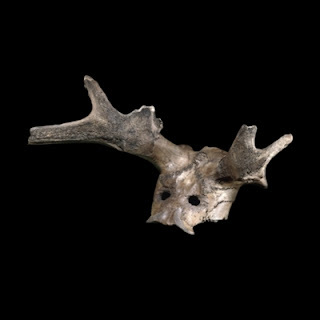 Mesolithic head-dress found at Star Carr, Yorkshire, now in the British Museum. 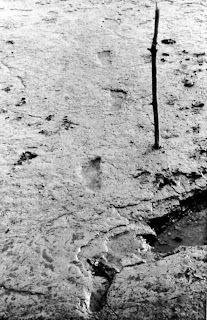 This is not to say that the Iron Age “Cernunnos” would have been understood by Nara in the same terms that Keine understands Min’Kammus, or that either concept would have been the same as that of the Mesolithic hunters, only to suggest that people of all ages responded to the landscape around them, with each generation drawing on its own past (the gap in time that separates Nara from Keine being no greater than that which separates Nara’s world (a world peopled also by figures as familiar to us as Claudius Caesar and Saint Paul) from our own. This is, of course, fiction. No academic writer would go nearly so far as Reedman or Jardine go in attempting to resurrect the belief systems of prehistoric societies, let alone the lived emotional responses to those beliefs that are depicted here, but that is what fiction, and perhaps only fiction, can do. For my second selection, I have chosen two works of non-fiction. As a historical writer, I naturally draw on both fiction and non-fiction as inspiration for my own work. One of my main concerns in writing Undreamed Shores was the depiction of a landscape which is likely to be both familiar and unfamiliar to readers. 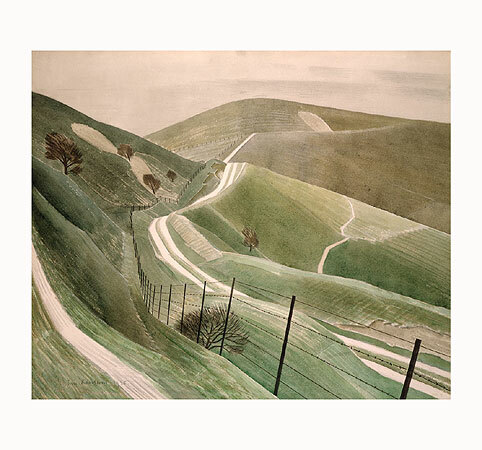 It is the landscape of Dorset, Hampshire and Wiltshire, but in 2400 BC, before those transformations (including the building of the Roman roads and the Norman churches & castles; the Agrarian and the Industrial Revolutions) that made it the landscape we know today. One of the books that first fired my interest in the English landscape was Jacquetta Hawkes’s A Land, initially published in 1951, but re-released this year as part of the Collins Nature Library. I must have read it for the first time when I was in my early teens and, having grown up on the granite of Jersey, the chalk of Kent, and the “Old Red Sandstone” of Devon were largely unfamiliar to me. Later, as a student at Cambridge, I had the privilege of meeting Jacquetta Hawkes – she had quite a forbidding reputation, but I saw nothing to justify this – she shared generously of her knowledge and experience. Hawkes, an archaeologist, set out to use “…the findings of the two sciences of geology and archaeology for purposes altogether unscientific,” to evoke an image of the land of Britain “…in which past and present, nature, man and art appear all in one piece.” Two themes dominate her book: the geological creation of the land itself over millions of years; and the growth, over thousands of years, of a human consciousness of it. Henry Moore and Ben Nicholson (both friends of Hawkes) contributed drawings to illustrate it. The image of the land that she evokes is built upwards and outwards from the rocks themselves. If it is good to see an old favourite given new life, it is better still to see some of its themes taken to a wholly new level in a new and original work. Such is Robert MacFarlane’s own book, The Old Ways (Hamish Hamilton). The human consciousness of the landscape is very much to the fore here, as is the unity of past and present. 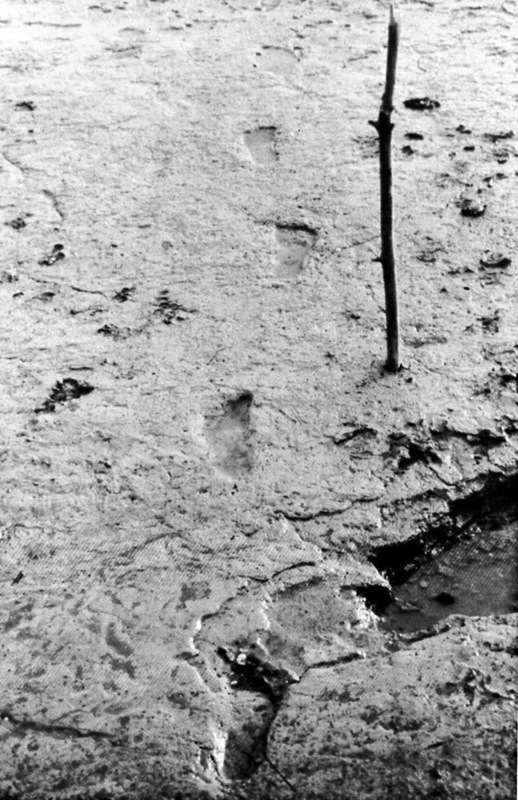 In researching the book, MacFarlane undertook a series of walks, following in the footsteps of a Mesolithic family (literally – their footprints are preserved in peat) in the intertidal zone of Essex and (figuratively) the Medieval pilgrims on the route to Compostela; following the Icknield Way across the chalk-lands of southern England; tracing the coffin-paths and drove-roads of Scotland; even accompanying a Palestinian colleague on a sarha (saunter) around Ramallah. The book is subtitled “A Journey on Foot,” but it includes also a number of journeys by sea around the western coast of Scotland. This combination made immediate sense to me In Undreamed Shores, I write about a world (southern England and northern France in c2400 BC) in which all journeys were made either on foot or by boat. My research included a walk from Christchurch to Stonehenge (five days of walking, fifty pages of notes, only ten pages in the book, but I could not have written it without the research), and drew also on many years of experience of sailing and open water swimming in my youth. On the British literary scene, and certainly in historical fiction, the book of the year was surely Hilary Mantel’s Bring Up The Bodies (Harper Collins, May 2012), winning her a second Booker Prize as well as taking her onto the shortlist for the Costa Book Awards. It was a book I had been looking forward to reading, and it certainly did not disappoint. Another book I greatly enjoyed was Cathie Dunn’s Dark Deceit (Crooked Cat, July 2012). Between them, these two very different books set out what historical fiction can achieve. Like Robert Graves’s Claudius novels and Marguerite Yourcenar’s Memoirs of Hadrian, Mantel takes us into the beating heart of the political establishment at a time of great political and social upheaval (Henry VIII’s “Great Matter,” the Dissolution of the Monasteries, the rise and fall from grace of Anne Boleyn), but gives us a window onto these events from an unconventional viewpoint, that of Henry’s chief minister, Thomas Cromwell. Other writers (Robert Bolt, Philippa Gregory, Jean Plaidy) have given us different perspectives on the same events, but Mantel is the first to take Cromwell’s point of view seriously, to “resurrect” him as a three dimensional character and explore this world through his eyes. Dunn writes more in the tradition of Sir Walter Scott’s Waverley novels, Charles Dickens’s A Tale of Two Cities or Andrew Miller’s Pure, focussing on characters caught up in the great sweep of history (in Dunn’s case the 12th Century civil war between King Stephen and the Empress Matilda), but at some distance from the “great” names that we know from the history books. It hardly matters whether such characters are fictional or historical since, in the latter case, we generally know very little about their lives. In Dunn’s book, we see the England and Normandy of “The Anarchy” through the eyes of members of the minor nobility, some of whom are “historical” (in the sense that their names and properties are known) and others fictional. The undercroft of the stronghold of Mortagne de Perches, Orne, a site associated with one of Dunn's characters. Loyalty and trust are key themes in both books. 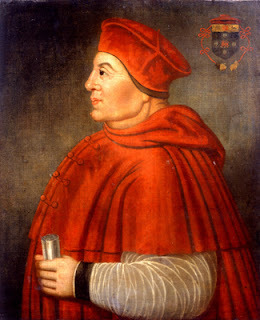 They are in short supply both at the court of Henry VIII (“Wolf Hall,” which Mantel took as the title for the first of her Cromwell novels, is the historical Wiltshire seat of the Seymour family, but is used by Mantel as a metaphor for Henry’s court more generally) and in the ungovernable lands of Normandy and England amid the shifting alliances of the mid-12th Century. In both cases, it is the distinctiveness of the viewpoint that takes us into territory that the historian can rarely penetrate. Western Christians celebrate the feast of the Epiphany on 6th January, commemorating the presentation of the infant Christ to the Magi, as outlined in the Gospel of St Matthew. In Matthew’s account, this is the first time that the child is seen by anyone apart from Mary & Joseph (the story of the shepherds is in the Gospel of St Luke – Mark and John say nothing directly about the Nativity). The Greek word ἐπιφάνεια refers to the direct physical manifestation of a deity on Earth. Anthropologists often use the word “epiphany” to refer to a religious ceremony in which a deity symbolically becomes present, often through the medium of a priest or similar specialist. There is evidence, however, that the pre-Christian peoples of Europe, for whom the sun itself was a deity, aligned their religious sites in such a way as to create their own “epiphanies” on particular days of the year without any need for the deity to be represented or impersonated by a human being. The Summer and Winter Solstices, together with the Autumn and Spring Equinoxes, may not have been the only such days, but they were probably the most significant, and are certainly the easiest to demonstrate. The passage grave of Newgrange in Ireland, built around five thousand years ago, is oriented so as to receive the rays of the rising sun on the morning of the Winter Solstice. I was privileged to witness this some years ago. 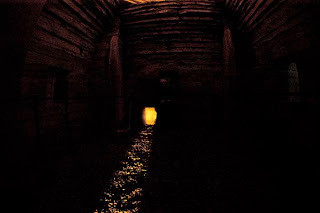 We crouched in the chamber and waited for the sun to pass through a specially designed box above the entrance, illuminate the entire chamber briefly, and then gradually recede down the passage. 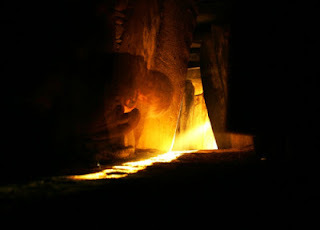 Sunrise at Newgrange (Cyril Byrne, Irish Times). The contemporary monument of Maes Howe in Orkney is oriented to receive the last rays of the setting sun at the Winter Solstice. I was there 29 years ago, but was not so lucky as I was at Newgrange: clouds got in the way. Sunset at Maes Howe (Charles Tait). Rather fewer people get to see the Midwinter Sunset at Stonehenge. The main axis of the monument centres on the Midsummer sunrise and the Midwinter sunset. For the past few years, English Heritage have opened it for the Midwinter sunrise, which slightly misses the point. Both the summer and winter ceremonies are featured in my novel, Undreamed Shores. It is difficult to imagine just what the experience would have felt like and signified to a man or woman four or five thousand years ago, witnessing it for the first time. You enter a narrow passage in the pitch dark at the behest of a priest, shaman or elder, who tells you that the god will appear to you personally, and it then happens! What would one feel? Fear? Awe? Amazement? Unless you have won the lottery (literally – there now is a lottery for admission), you won’t be able to greet the sunrise at Newgrange tomorrow morning. You can, however, follow it on a live webcam from around 0730 GMT at www.rte.ie/newsnow. I am not sure of the current arrangements at Maes Howe – when I went, one had only to turn up – but again, there is a live webcam from around 1530 GMT at www.maeshowe.co.uk. Mark Patton's novels, Undreamed Shores, An Accidental King and Omphalos, are published by Crooked Cat Publications, and can be pucrhased from Amazon. Donne’s poem is dated 13th December, 1627. The 13th December was then, and still is, Saint Lucy’s day; but it no longer marks, as it did in 1627, the Winter Solstice. Donne lived his life according to the Julian Calendar, whilst we (post-1752) live ours according to the Gregorian (a fact to be borne in mind by those of us who write historical fiction and care about whether a particular date in a certain year fell on a Sunday or a Tuesday, or whether the moon would have been full on the night our characters set sail from a certain port). The Winter Solstice now falls on 21st December (same day in solar terms, different position in our human calendar). Donne’s “Nocturnal” is, on the one hand, a lamentation on the human experience of bereavement and, on the other, a meditation on the transience of life and its concerns. Donne draws an explicit link between the low point of the solar year (the Winter Solstice) and the low point in the life of an individual (the death of the person he most loves). 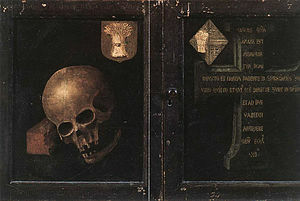 The Braque Family Triptych, by Rogier van der Weyden, Musee du Louvre, Paris. In making this connection, Donne is drawing on a much older theme, a link between death and the Winter Solstice. That the Winter Solstice was marked in prehistory has long been understood. The principle axis of Stonehenge, for example, is solsticial, with key alignments based on sunrise at the Summer Solstice and sunset at the Winter Solstice. 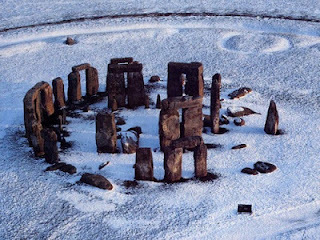 A team of archaeologists led by Professor Mike Parker-Pearson have recently argued that the Winter Solstice at Stonehenge may have been more significant than the Summer Solstice, linked to their understanding of the site as a funerary monument. The winter sunset would be viewed from the Avenue, almost certainly the ceremonial approach to the monument, whereas the summer sunrise would have to be viewed from the other side of the monument, or from within it. In my novel, Undreamed Shores, I depict both a winter and a summer ceremony at Stonehenge. I have more people from a wider area participating in the summer ceremony (in a society without permanent bridges, it would be difficult to travel around a landscape in which the rivers are likely to be in flood), but it is the winter ceremony that I describe in greatest detail (for the simple narrative reason that this is the first ceremony experienced by my protagonist at the site). 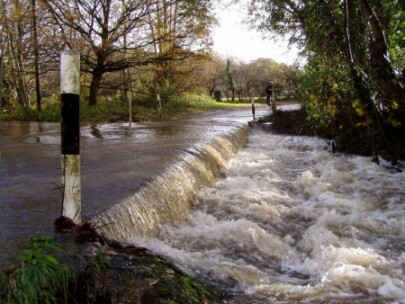 The Lin Brook (a tributary of the Salisbury Avon, which runs past Stonehenge - "the River Elawar" in Undreamed Shores) in flood.